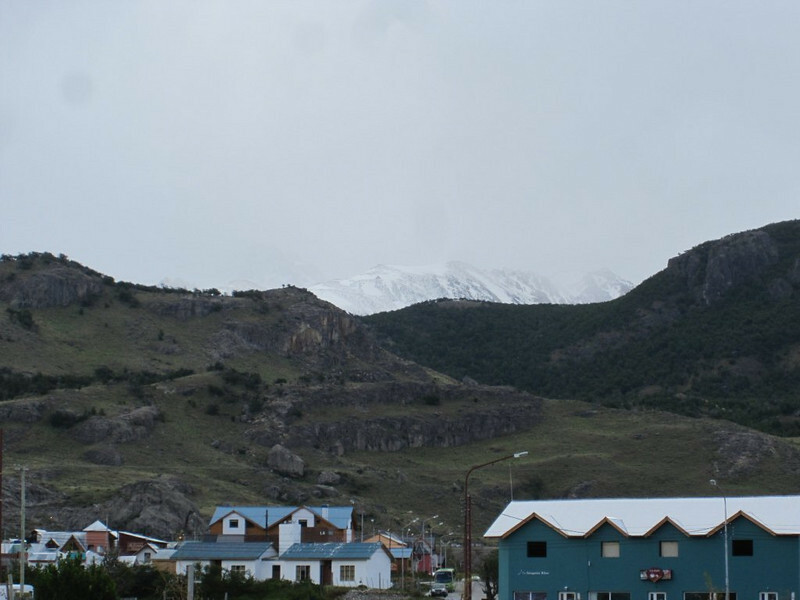 Having sneaked our way into El Chalten in the midst of a snow and rain storm, we had been quite pleased to make it to our comfy little hotel snuggled in the back of this hiking and trekking town. The rooms were small and spartan, but they were indeed warm and inviting and we took off our cold and damp riding gear and put on some nice dry warm clothes. It just felt good to be out of the wet and wind. We hung around our little hotel catching glimpses out the back picture window of the hotel of what was supposed to be beautiful mountain scenery. 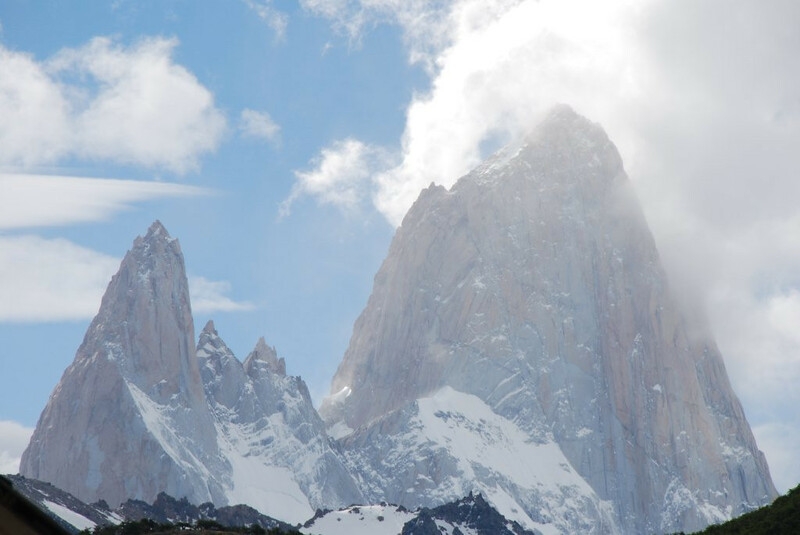 But rushing clouds and quick bursts of sun only served to tease us with a quick sighting of a sheer rock wall or shining ice, which would almost immediately become engulfed in a roiling mass of heavy wet cloud. If these gringos wanted to see the mountain scenery, they were going to have to be patient. Our little hotel. Second from the left. 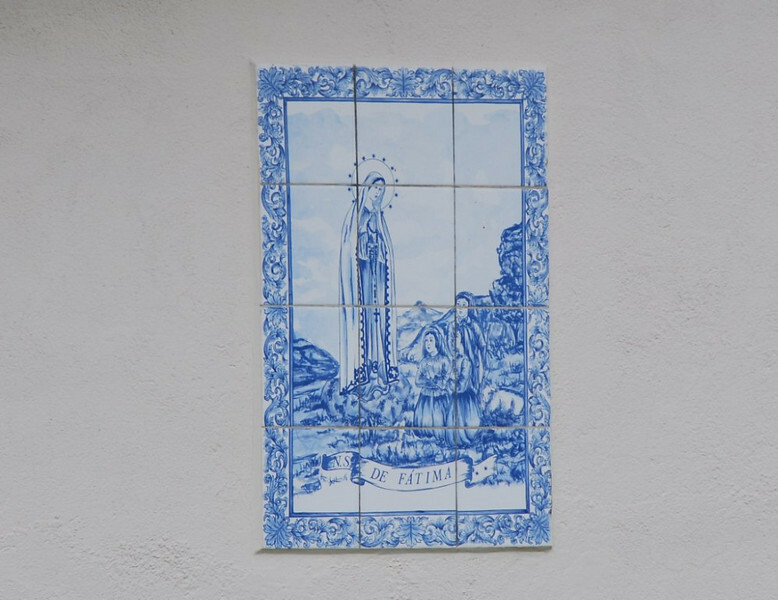 The hand painted tiles in the side of the house. Close up fo the hand painted tiles in the side of the house. 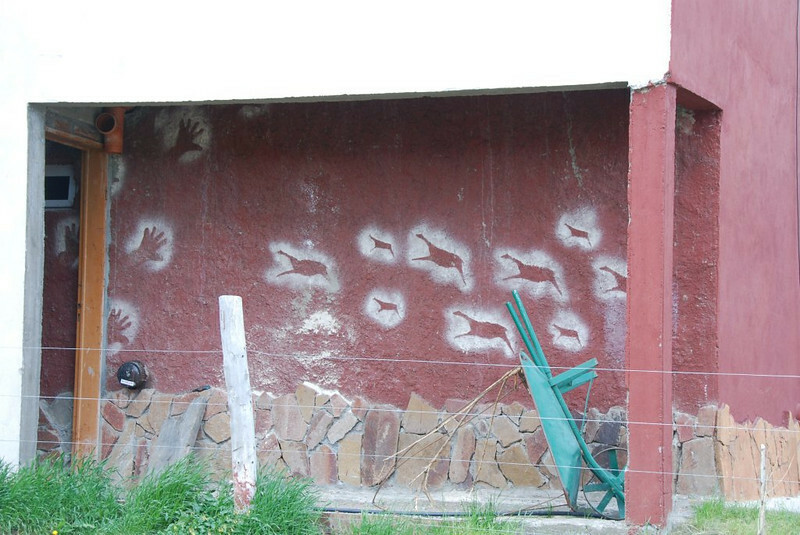 Cave paintings on the side of a house. 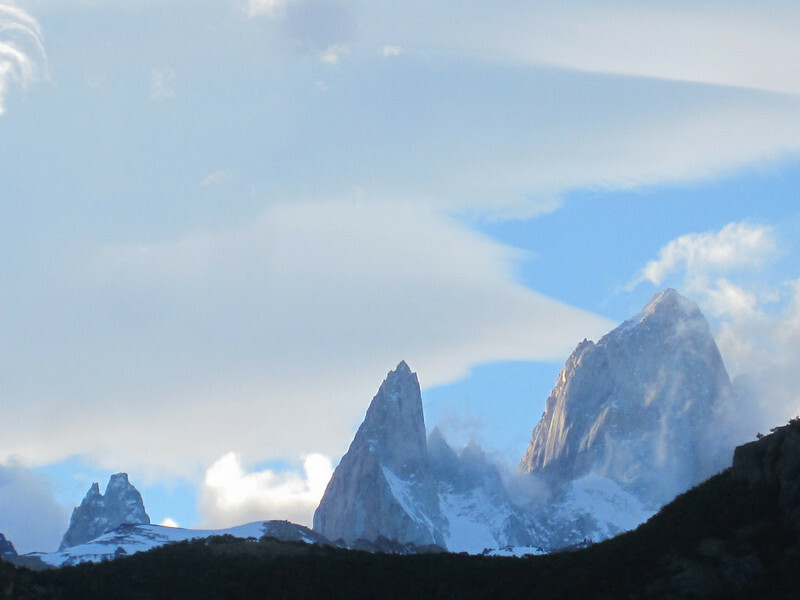 The view from the plateau down onto El Chalten. 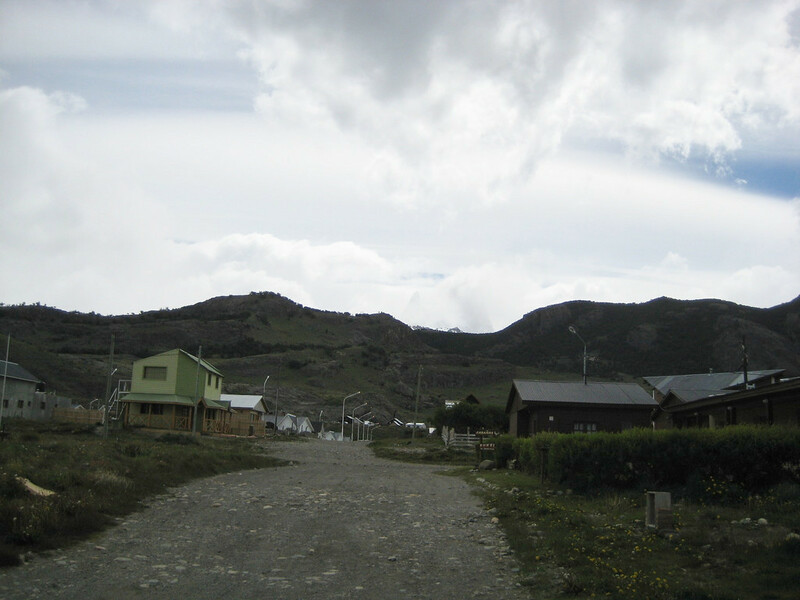 The entry road into the town within the town of El Chalten. 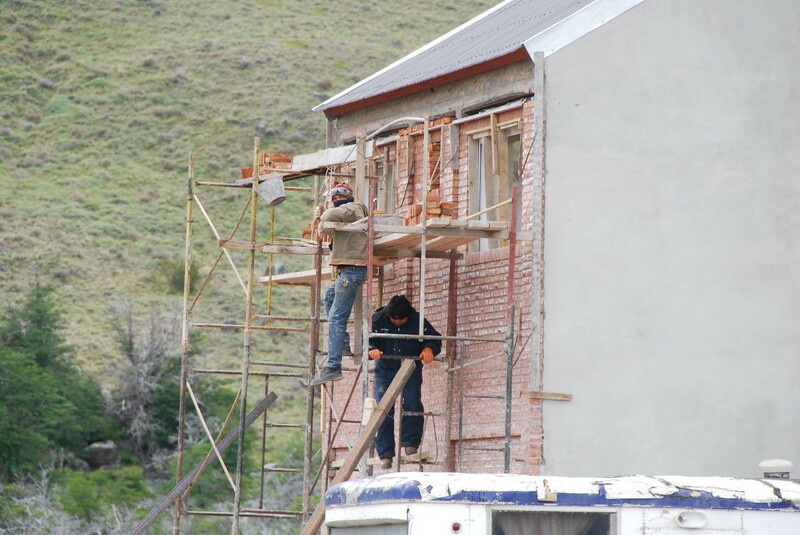 Locals working on their homes in the chilly wind. Kim with Waldo in the background heading for cover. Locals chatting in native garb. Not so local in partial native garb. It began to get a little later in the evening so we decided to stroll into town as the days wind started to diminish as did the rays of the sun. 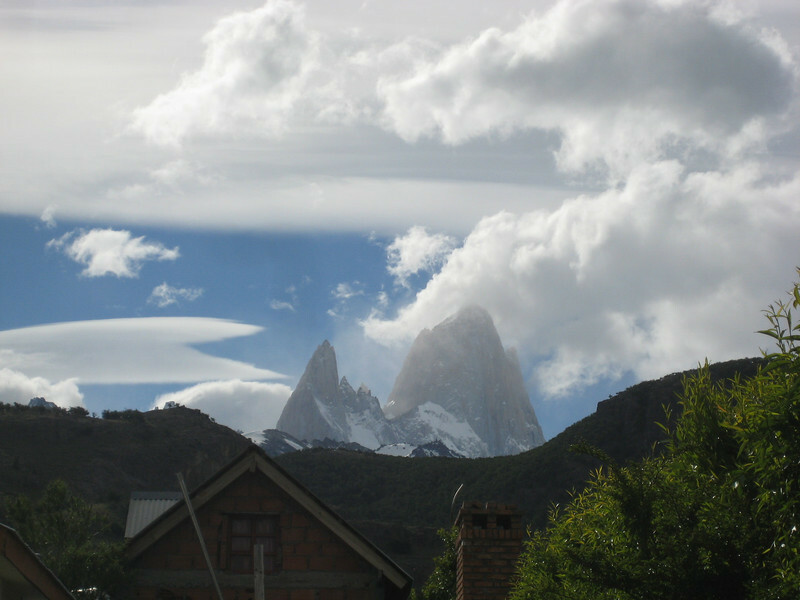 Whether it was it the setting sun taking pity on us or the spirits that surround El Chalten, something seemed to want to take pity on us and the rain and snow stopped as quickly as it had started and the clouds raced away to parts unknown. 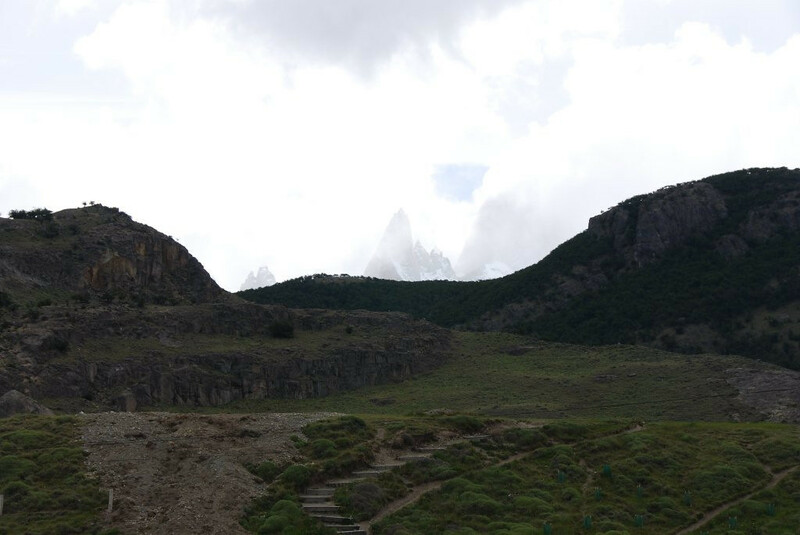 For as we walked out of our place of respite and looked behind us, two towering behemoths came into view. Pointed and sharp as only newly minted mountains can be, they pointed skyward, appearing to rend the clouds from the sky. Then a third smaller pike came into view, these rock monoliths were not to be ignored, they wanted their presence known. They had made their points. We stood there slack jawed, clicking pictures at alarming tourist rates. It was a conundrum of sorts. I wanted to take pictures to have memories, but I didn’t want to experience the sight solely through the limited view of a camera lens. I must have looked pretty foolish, camera up, camera down, camera up, camera down. The net result, fuzzy pictures and an even fuzzier remembrance of the exciting scene. Next time I’ll have to choose. Ultimately, we were able to tear ourselves away from the scene and do a little strolling, get some dinner and even a little shopping done in town. Kim got some fun things and even I got something that you’ll see later (shade your eyes and hide small children). 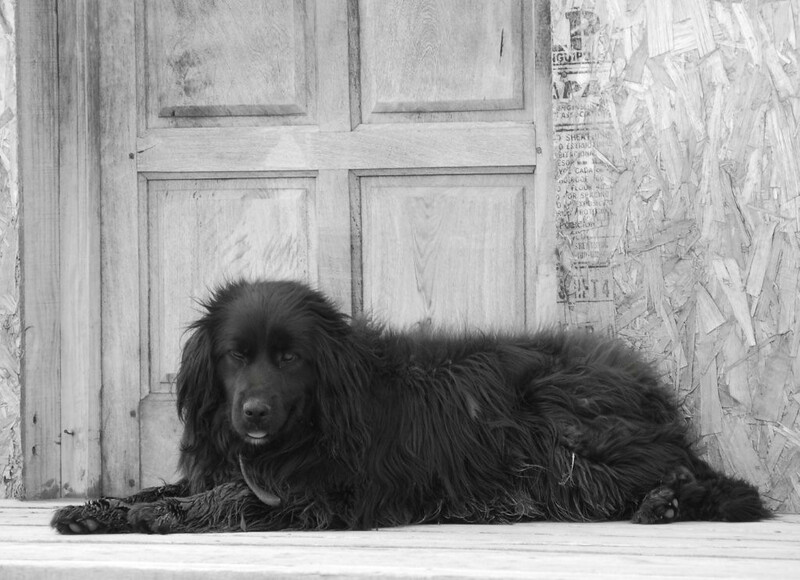 We chatted with the shop keepers as best we could and even a couple of locals. 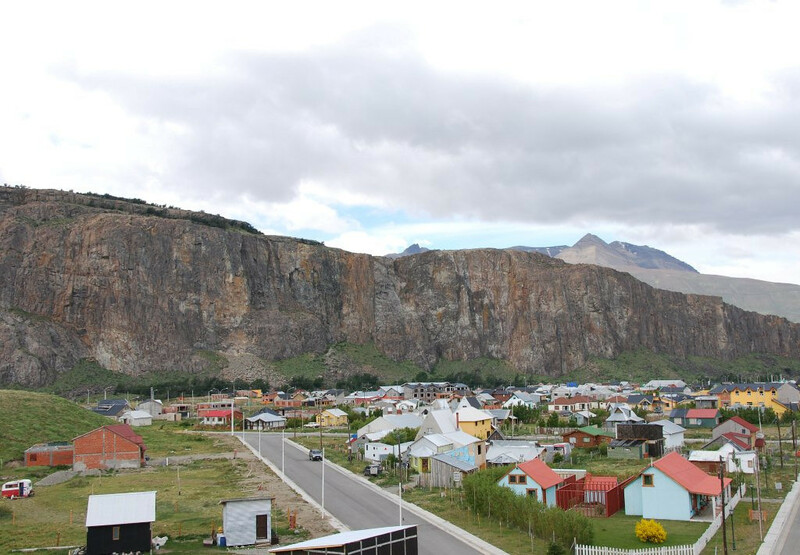 Overall we had a pretty nice late afternoon in El Chalten but we were pretty tired from the day of riding in the weather so after filling ourselves with empanadas, we headed back to the hotel for a good nights rest. When we awoke the following morning the sun was out but the wind was again up. 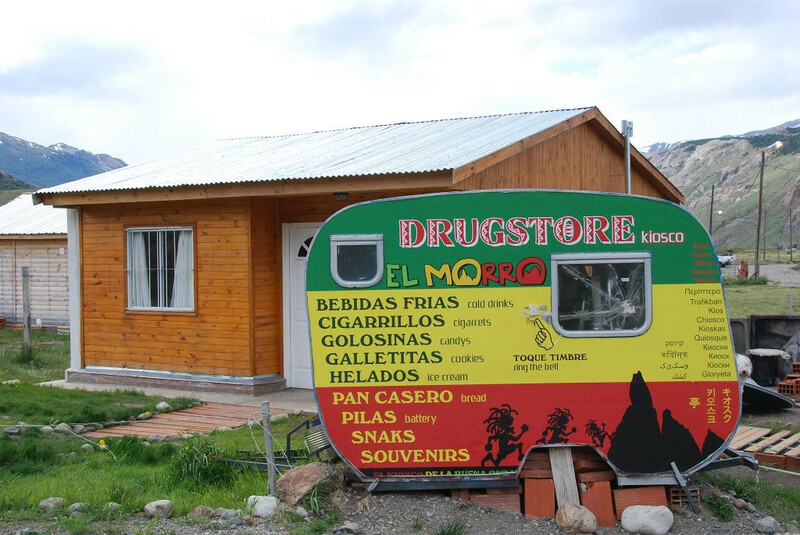 However, we weren’t going to let that stop us from investigating the rest of El Chalten. 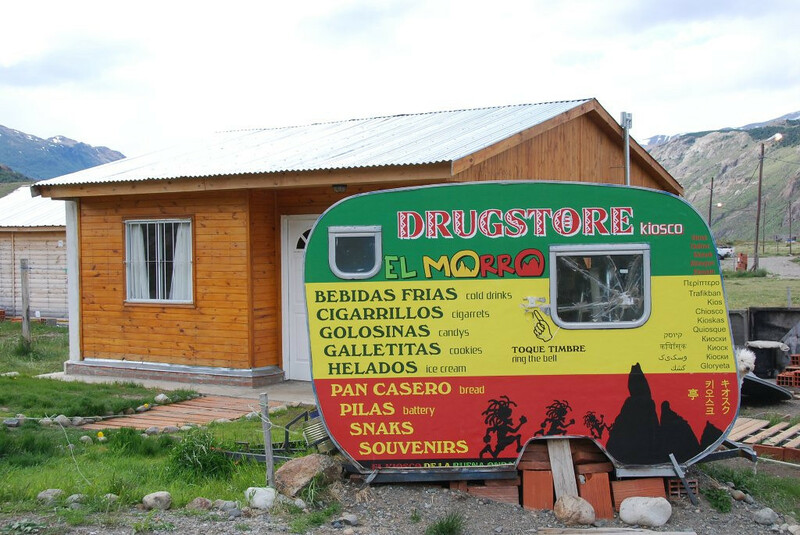 We’d heard that as well as being a climbing and hiking center, El Chalten also had a reputation for being a bit of a hippie throw back town. This we had to see. So we started out after breakfast and just started walking around the small mostly dirt streets. Houses were in varying condition from very good to not very good, but everyone in the town seemed to be in good spirits and even though the town did not seem affluent by any stretch of the imagination, people seemed to take pride in what they owned and they tried to make their places look nice. Some folks were very creative in their decoration. Hand painted tiles were fitted into the sides of buildings leaving a rather beautiful adornment to what would otherwise be a very plain house. 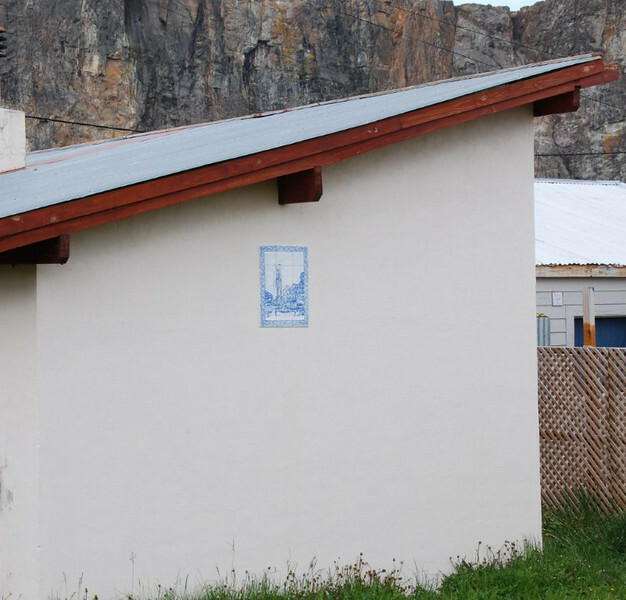 Another had used stencils to make “cave paintings” on the side of their house. There was just a great deal of creativity amongst the townspeople. But we would find even more later in the day. 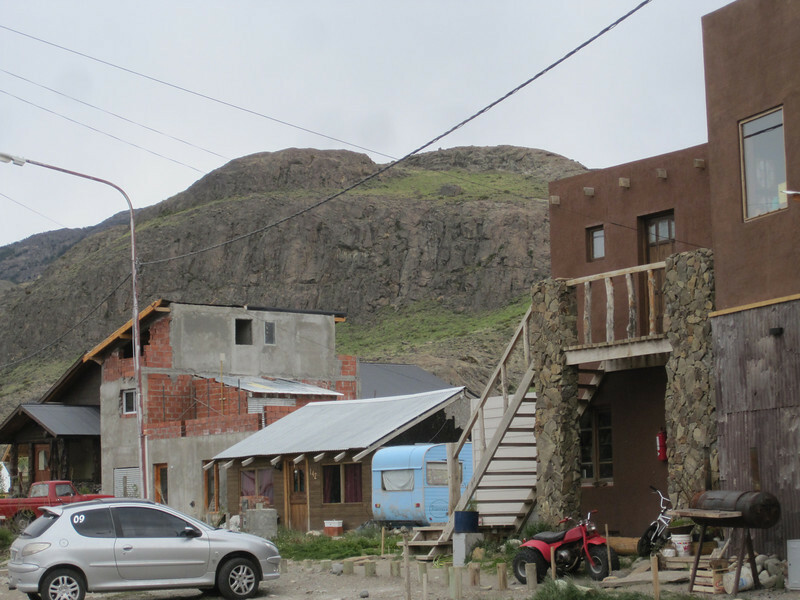 As we walked to the back of the town, we found a staircase that led up to the top of a plateau. You could see that it led up, but you couldn’t ultimately see where it was leading to. So curiosity obviously not under control, we marched our way up the stairs to the top of the plateau and found… another town! 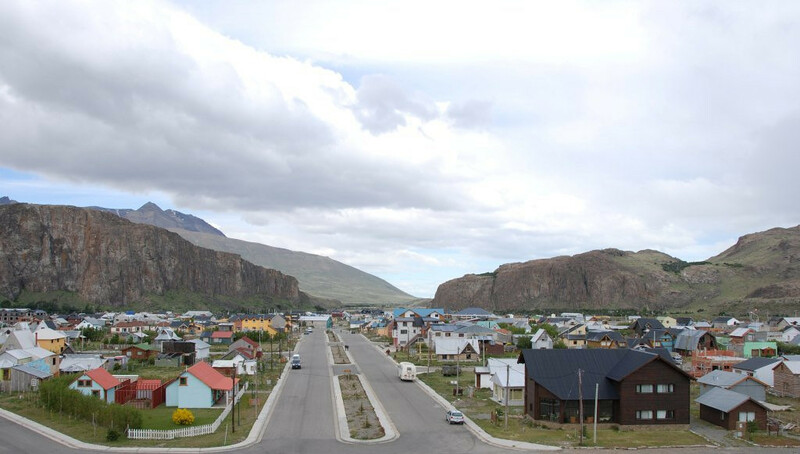 Yes, there was another little town within the town of El Chalten. 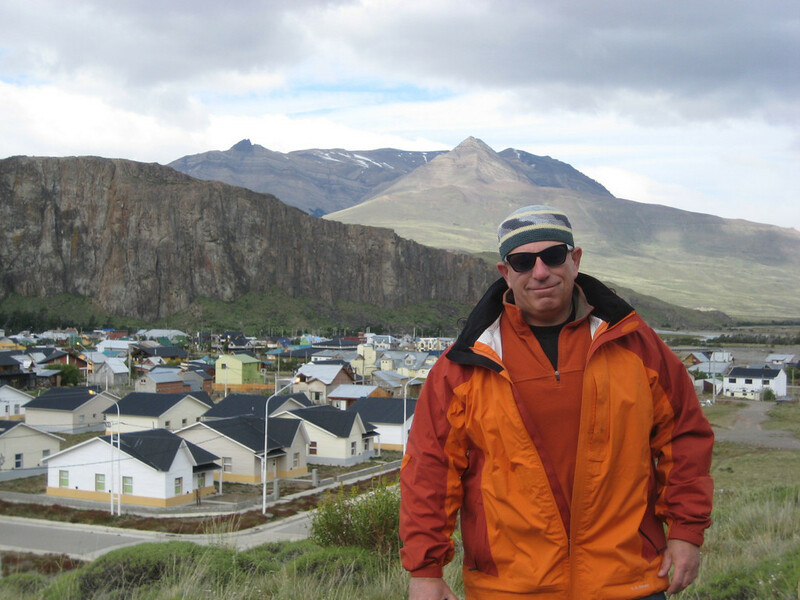 It had a glorious view of the town below as well as the surrounding mountains. It was breathtaking. But there was more to come. 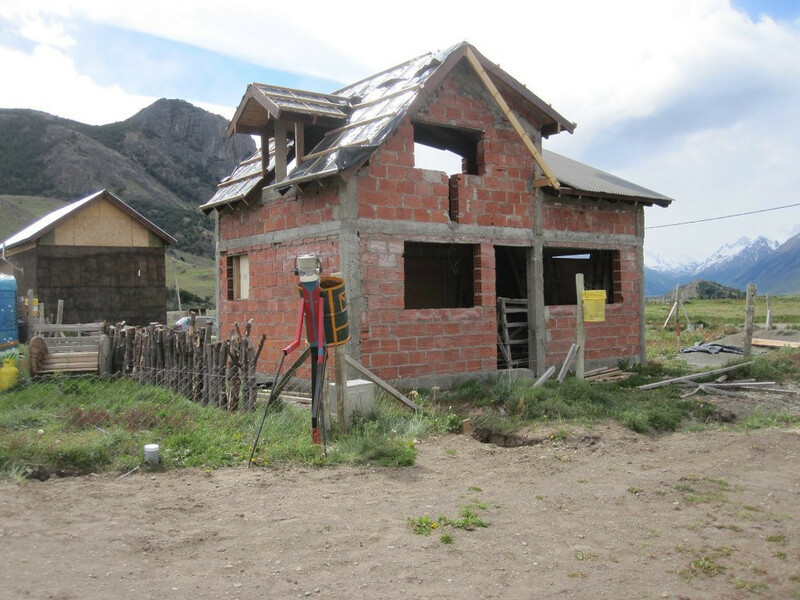 This town was just being built and many of the houses had yet to be completed. Some were actively under construction while others seemed to be waiting for their next phase to commence. But what was really cool about this little town within a town was that each street had its own ambassador waiting to greet you as you entered. 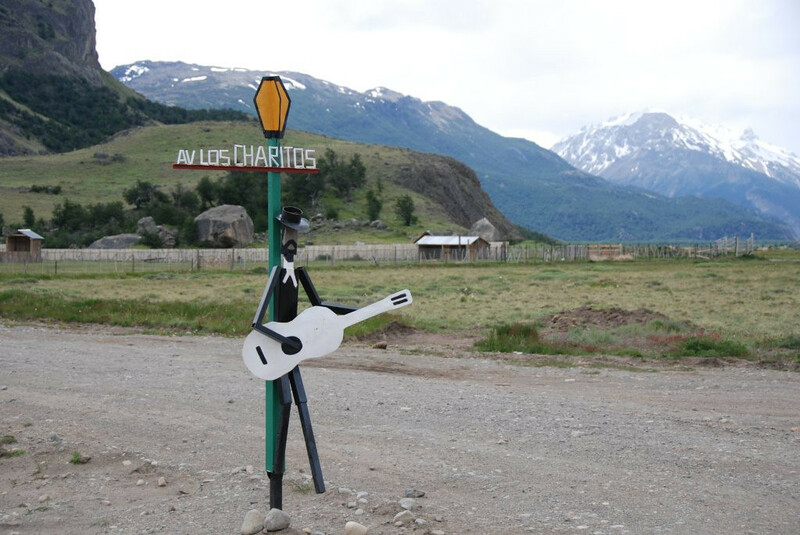 Hand crafted from whatever was available, there were statutes of birds, bicyclists, guitar players, skiers, and whatever the towns people felt would be a nice welcome to their little street. 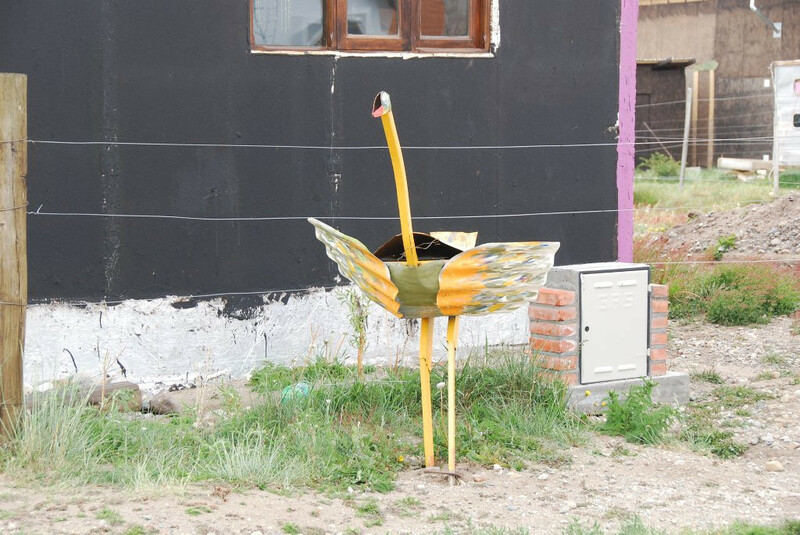 It was great to see that the residents of this little town had taken the time to build a little more charm, a warm welcome for themselves and everyone who came to visit them. It was great! There was also another ambassador of sorts. 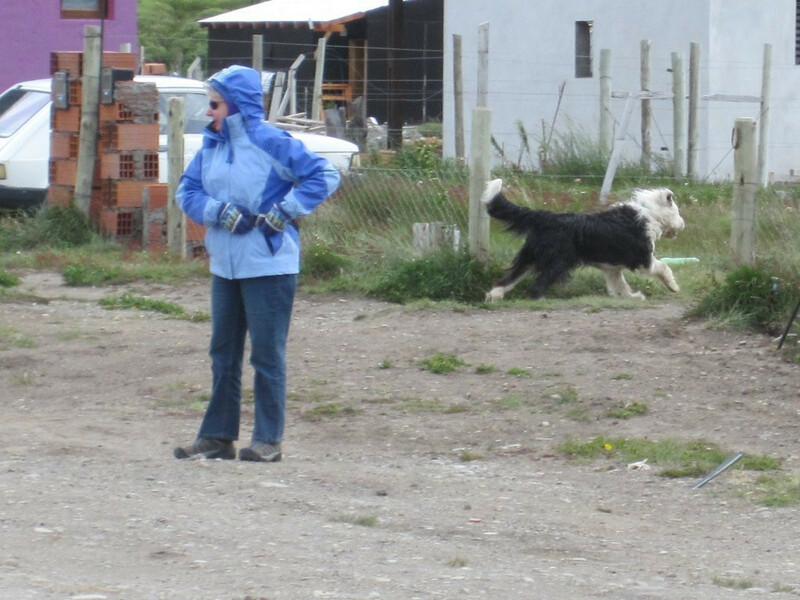 An Old English sheepdog that had a habit of sneaking around following Kim wherever we went, but never got close enough for her to pet. He must have been the shy type. But he did indeed turn up in several pictures, pictures that I didn’t know he was in when I was taking them. He was sort of like a Where’s Waldo dog! We enjoyed ourselves immensely up on the little plateau taking pictures and strolling the streets with Waldo. Ultimately we had to head back to the hotel because the wind was still up and it was getting chilly. So back down the stairs we went and we spied a couple of the locals chatting in local clothing. I just loved the look of their local garments. 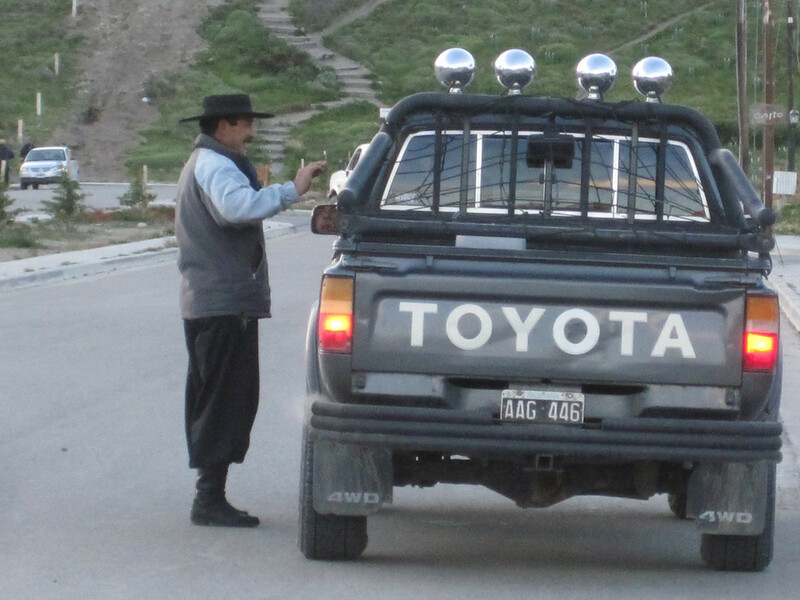 It make me aware of the fact that I was in Argentina where there are still Gauchos! Awesome. 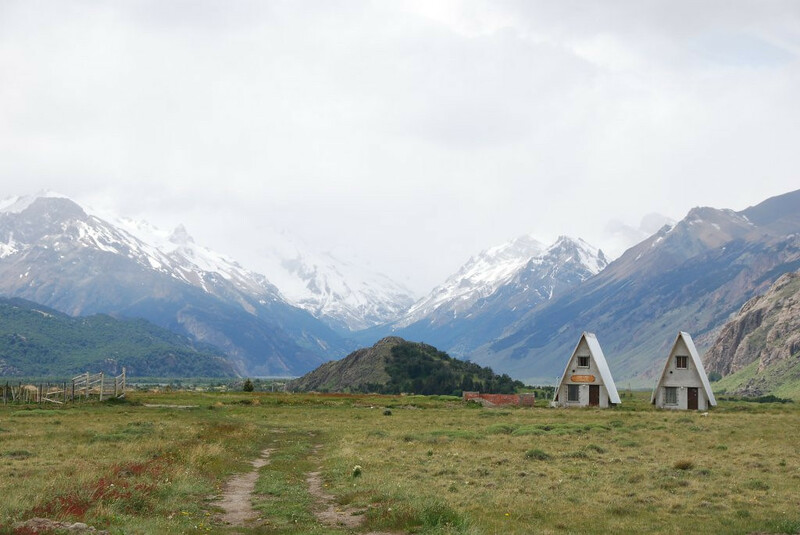 As we made our way back to the hotel, we were thankful for all that we were able to see and do in El Chalten. We’d enjoyed every minute we’d been there, and tomorrow, rain (or snow) or shine or heavy wind, we were headed off to El Calafate where we’ll take you in Part 10. 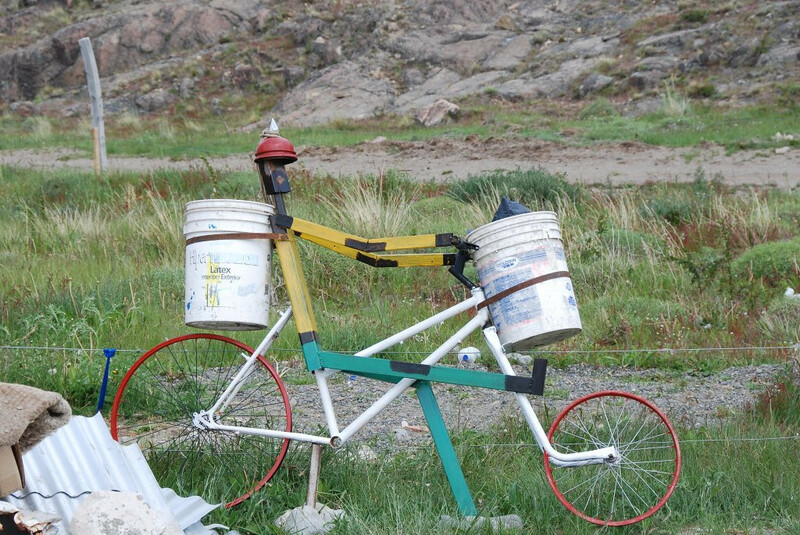 This entry was posted on October 6, 2012 by Ride2Adventure. It was filed under Adventure, Adventure Motorcycling, adventure riders, Adventure Rides, Argentina, Chile, dual sport, enduro, Fin del Mundo, Motorcycle, off road, Overland, photo, pictures, R2ADV, Ride2Adventure, Travel, Uncategorized and was tagged with adventure, adventure bike, dual sport, enduro, kimike, motorcycle, off road, overland, photo, photography, picture, ride report, ride2adv, ride2adventure, travel. So, what was it that you bought that small children shouldn’t see and you would show us later?